Botox injections continued as the most popular minimally invasive cosmetic procedure in 2015, according to the American Society of Plastic Surgeons. 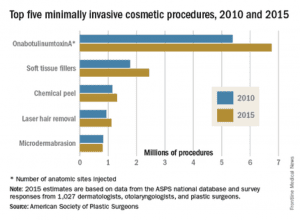 There was a total of 14.2 million minimally invasive cosmetic procedures performed in the United States in 2015 where an estimated 6.8 million were Botox procedures. Soft tissue fillers were second in popularity among cosmetic patients, with over 2.4 million procedures performed, followed by chemical peel (1.3 million procedures), laser hair removal (1.1 million), and microdermabrasion (800,000). All these procedures continue to be very popular at the office of Dr. Benjamin Bassichis, a top Dallas Facial Plastic Surgeon. Can Rhinoplasty Improve My Nasal Fracture?